The city’s dark side consists of the favelas, the shantytowns that climb along the steep mountain slopes plagued by gang violence and drug trafficking gangs. The largest slum Favela da Rocinha is Brazil’s largest shantytown with a population of 250,000. Some claim nearly one third of Rio’s inhabitants live around the ridge in the favelas in Rio but official numbers are about 1.3 millon people live in the 750 favelas in Rio. “If you run you’re dead…if you stay, you’re dead again. Period.” The life in the favelas has received more publicity. Since the movie “City of God” the world knows the violent favelas. The violent movie “Cidade de Dieus” (City of Good) from 2002 is about two boys growing up in a violent neighborhood of Rio de Janeiro take different paths: one becomes a photographer, the other a drug dealer. The pacification In 2008 the politicians decided to take control of the favelas and trying to get them peaceful for the Olympics with a special police force UPP. The new police force UPP is ever present and in some favelas it has been fierce fighting and many died. 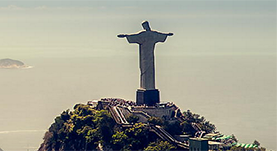 Rio de Janeiro is a city made up of many different cities and different urban centers. The favelas have grown up gradually along the city’s many hills and mountains. The social and economic inequalities are very real in Rio de Janeiro. Many residents have moved there from the poor northeastern Brazil. Today you can not really call them shacks – the houses are usually built of brick and the interior is not always distinctly shabby. In recent years, have officially made efforts to reconcile the favelas with normal society so that residents can qualify for a reasonable service. Geral Alemão and Rocinha are the poorest slums of Rio. Vidigal is one favela with a fantastic with view over Rio. There have been violent riots in the favelas because politicians want to make one of the world’s more dangerous cities safer and stop the violence before the Olympics and World Championships. The government created a $260 billion plan to invest in the favelas to improve infrastructure and support the economy and they have UPP, Unidades de Policia Pacificadora, a police corp specializing in Favelas. Questionable tourist activities are guided tours of favelas. You go into open Jeeps to visit the favelas in small groups, as if it were on Safari. But residents welcome tourism and the safety of trips guided are guaranteed by the various gangs that control the favelas. 160 000 people live in Rocinha favela and it is “quietly” so organized excursions by jeep visit the favela. If you are a gringo it is a really bad idea to visit them by yourself. There are several criminal organizations among them Comando Vermelho (CV), Terceiro Comando Puro (TCP) and Amigos dos Amigos (ADA) and you can find some streets tagged with for instance CV. Michael Jackson recorded the video for “They Do not Care About Us” in favela Santa Marta in Botafogo, maybe the publicity helped because this area has undergone a process of urbanization. Today Santa Marta is considered one of the most safe places in Rio since the police some years ago threw out the drug gang ruled the area. They now have guided tours and a bronze statue of the King of Pop. A rail bus runs every quarter up the hill and you can visit Michael Jackson Square.